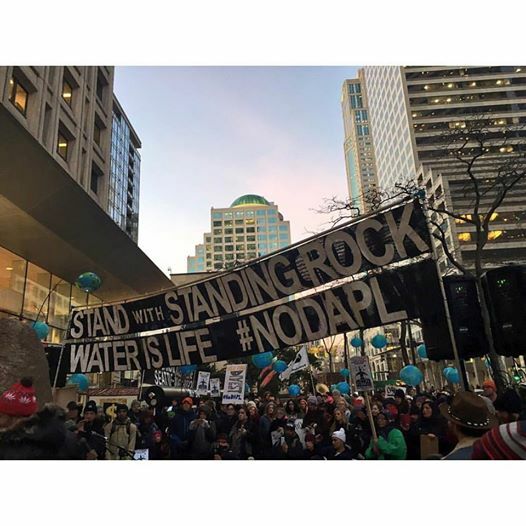 Cannon Ball, N.D. — Today, the Standing Rock Sioux Tribe filed a motion with the U.S. District Court in Washington, D.C., asking District Judge James Boasberg to throw out Dakota Access’s lawsuit against the Army Corps of Engineers. The Department of Justice, which represents the Corps, filed a similar motion. The motions do not effect the lawsuit filed by Standing Rock Sioux Tribe against Corps permits, which are currently held in abeyance pending the recently initiated Environmental Impact Statement (“EIS”) process considering route alternatives. After initially supporting the Army Corps against the Tribe’s earlier litigation about the pipeline, DAPL shifted its position to sue the Corps, arguing that it had all the permissions it required in order to complete the pipeline across Lake Oahe. The lawsuit came as a surprise, as DAPL had previously acknowledged that it still required a real estate easement – that has not yet been granted – before finalizing construction. The lawsuit came after the Army Corps announced on December 4, 2016, that it would prepare an EIS considering both the Tribe’s treaty rights and route alternatives to the Lake Oahe crossing. In its motion to the Court asking it to dismiss DAPL’s lawsuit, the Tribe explained how the Corps has not, and could not have, issued the easement yet. It also explained how the Corps’ decision to provide a full EIS on route alternatives for the pipeline was legally required and appropriate in light of the history of the Sioux. The tribe is still awaiting publication of a notice of intent to prepare an EIS to be published in the Federal Register. This entry was posted in Tribal Leadership and tagged Dakota Access Pipeline, Energy Transfer, Justice Department, Last Real Indians, LRInspire, Standing Rock Sioux Tribe by lrinspire. Bookmark the permalink.